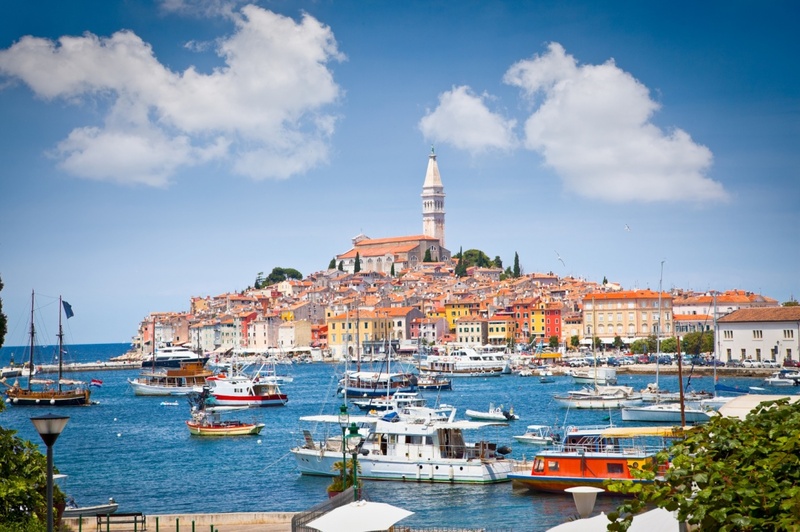 Rovinj is, according to many, the loveliest and definitely the most romantic town in Istria. Situated at the western shores of the peninsula and shielded by the 22 islets of its own little archipelago, Rovinj is often dubbed the pearl of the Adriatic coast. The scenic beauty of its narrow streets, romantic atmosphere, cultural heritage, natural wonders and rich specter of tourist services made Rovinj one of the most important tourist centers in Istria. Although a small city, Rovinj has immensely wide palette of cultural and natural sights, all wrapped up in one neat, irresistible package. The most prominent and most recognizable sight of Rovinj is its old city situated on a small, artificially made peninsula. This limited space is filled with characteristically built, narrow houses separated by narrow, stone covered streets and small squares. A monumental baroque church of the Rovinj’s saint patron, St. Eufemia, dominates the city view. The large statue of the saint, gracing the top of the bell tower, revolves around its axis by the strength of the wind. Rovinj is surrounded by beautiful natural sights, most of them protected as the natural heritage. Looking from the sea, Rovinj is surrounded by the archipelago of 22 small islands and islets. The biggest ones, St. Andrew and St. Catherine, are beloved bathing destinations of the locals and are considered rarities in terms of vegetation diversity. Zlatni Rt (Golden Cape) forest park is one of the most significant gardens on the Croatian coast, with over 1000 plant species. A few kilometres north of Rovinj you can visit the first bird reserve of Istria, the Palud Wetlands. Be sure to explore the nearby Lim Bay with Romuald’s Cave, the site of the oldest remains of early man in Istria. Rovinj is often dubbed the most romantic city of the Croatian coast. Every August, the city hosts a unique romantic event, the Night of St. Lawrence. It is one night when the shooting stars phenomenon is best visible. The public city lights are turned off and the city streets are lit by the torches and candle lights while numerous concerts are taking place all over the city center. Although surrounded by the aura of romance, legends and mysticism; Rovinj has the rich tourist offer; from accommodation to a variety of beaches and leisure activities. There are numerous hotels in the wider city area, most of them four star, with one luxurious five-star resort, the newly opened Angelo D’Oro. You can choose from a variety of tourist settlements (Villas Rubin, Amarin), auto-camps (Valalta, Amarin, Vestar, Polari, Porton Biondi) or numerous private accommodation options. The city doesn't lose its charm after the sun sets; there are several nightclubs and cocktail bars by the sea, where you can enjoy the good company and inviting dancing rhythms until the early morning hours. The most popular club is the Nightclub Lone. Every summer, Rovinj hosts the Croatian Salsa Festival and Avantgarde Jazz Festival. As most of the Istrian places, Rovinj has a rich and specific gastronomic offer. Local eating venues promote hospitality, kindness and professionalism while guiding you through the unique sensation of Istria; a gastronomic fusion of Mediterranean and continental culture. There are numerous restaurants, trattorias and taverns to choose from. Restaurants Monte, Segutra, Santa Croce and Giannino are among the praised eating venues. Find information about selected Hotels, apartments and rooms in Rovinj to choose the perfect place for your accommodation.